Prior to 1800, Robert Lathan/Leathan emigrated to Charleston, S.C. After staying one year in Williamsburg County, S.C., he moved to Lancaster County, S.C. and then settled in Fairfield County, S.C. in the Wateree section near what is now known as White Oak. His land transactions are recorded in the S.C. Dept. of Archives and History in Columbia under Fairfield County Deeds on microfilm rolls C307 (Vol. II, pp. 29-31, 123-124 and Vol. LL, pp. 507-510), C303 (Vol. U, pp. 270-271,276-277), and 158 (Vol. LL, p. 317). After the death of his wife, he moved to Tipton County, TN, to live with his daughter, Sara McLerkin. Spirit that they may rest from their labours and their works do follow them"
Blessed are the dead... "
Note: Photos of these tombstones are posted on this site. Click "Photos" page then "Thumbnails 2"
who departed this life August 25th 1832 aged 24 years 11 months & 13 Days. departed this life Dec 18 1831 aged 29 years 6 months & 11 days. 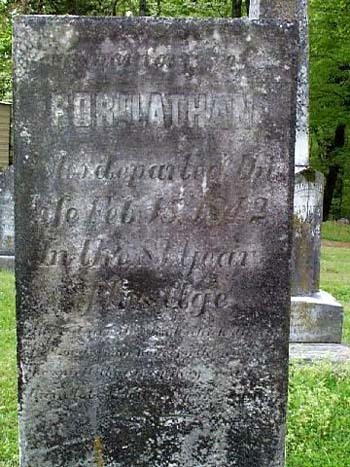 "Blessed are the dead who dies in the Lord"
There is an image of a map to the Lathan Cemetery in Fairfield County, S.C. and photos of the tombstones. To view this map and photos go to the "Photo" page and then the "Historic Thumbnails" page. I believe it may be interesting to explore exactly why, how and with whom this emigration took place. I have found a number references to Robert filing for citizenship in both Chester and Fairfield Districts. I hope to explore this in more detail if and when I get to personally explore the South Carolina Archives in Columbia. However, I may already have part of the how, and with whom. There is a reference on page 73 of the Fairfield County Court Records (Wills) stating Robert Lathan was mentioned in the will of Samuel Waugh. He also was a witness to the recording of this will on 21 Oct. 1794. It would be interesting to dig out the relationship between Robert Lathan and Samuel Waugh as Robert Lathan's Mother was a Peggy Waugh of Ireland. Also interesting, is the fact that a John Waugh was a buyer at the estate sale of Samuel Waugh on 10 April 1795. So about the time that Robert Lathan emigrated the Waughs were apparently settled in South Carolina and had established at least a small estate. Perhaps the Waughs were at least part of the draw upon Robert Lathan which brought him to America. The humble petition of Robert Leathen - Showeth - That your petition was born in Ireland a subject of the King of great Britain, that he immigrated to this country, landed in Charleston on the fifth of December 1788 and hath continued to reside in the state aforesaid ever since that time, that it is his bonafide intention to become a citizen of the United States of America, and that he has resided at least five years previous to this time in this state within the limits and under the jurisdiction of the United State and one year at least in this State. We the subscribers do hereby certify that Robert Leathen who now petitions to be made a citizen has resided twenty years previous to this time within the limits of the United States and at least one year within the limits of this State and that he has behaved himself as a man of good moral character, attached to the principles of the Constitution of the United States and well desposed to the good order and happenings of the ________(unreadable). Another set of citizenship papers for Robert Lathan dated, Oct. 24, 1832, exist but appear to be for a different but possibly related man. If related the man must have been a close cousin. This is confirmed by research done by Chris Russell (contact me for his Email address). According to his research this Robert Lathan born in Belfast in 1793 and came to the U.S. in 1819. His father was named William Lathan. His mother's name is unknown by Mr. Russell. 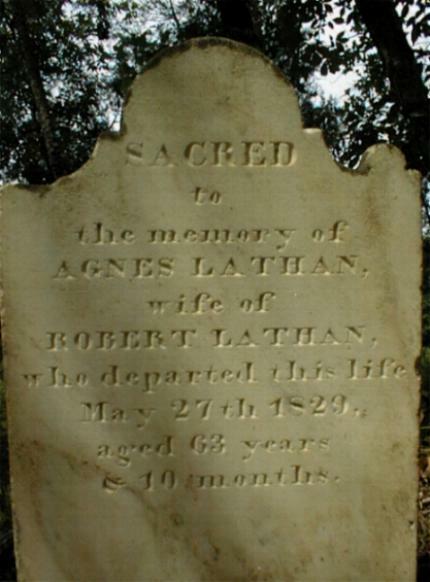 This Robert Lathan married Margaret McClintock sometime before 1823. This line left the Chester/Fairfield County area sometime before March 6, 1846, when the birth of Grandson took place in Indiana. Sources: Citizenship papers-South Carolina Archives, Tombstone inscription for Robert Lathan and photo of tombstone-Robert Farris of Rootsweb Tipton County TN email list, Lathan Cemetery location and inscriptions and deed-George Moore of Chester, S.C. (a cousin), photos of Lathan Cemetery-William C. Lathan, Jr.